We will be giving a pitcher of Shepherd Neame beer, lager or cider to five supporters through our Facebook, Instagram and Twitter accounts, starting Monday 15th April 2019 and finishing on Saturday 27th April. 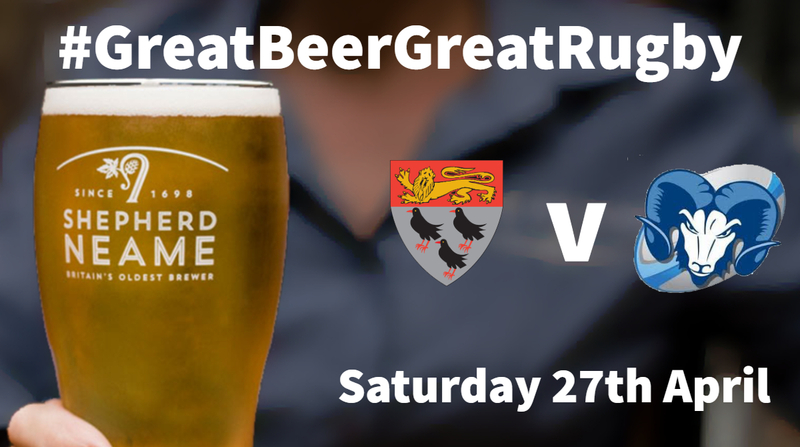 To be in with a chance to win a share our promotional image and add the hashtag #GreatBeerGreatRugby to your profile or story. You must also be at the match on the 27th April 2019 to collect the prize. Be sure to follow us on social media to be able to enter. Canterbury Rugby Football Club (CRFC) pitcher giveaway is open to UK residents only aged 18 years and older. Proof of age may be required to collect the prize. This giveaway is conducted on social media only. CRFC will post a giveaway on our Facebook, Instagram and Twitter accounts during the build up to the last home game of the 2019/29 season against Rams RFC. Only entries received up until 6am on 27 April 2019 will be included in the prize draw. Entrants must type the hashtag #GreatBeerGreatRugby onto the post/tweet to be entered in the draw. Winners will be randomly selected on 27 April 2019 by a member(s) of the CRFC Committee. Winners will be contacted privately by CRFC through social media on 27 April 2019 and a voucher sent to them. Prizes must be collected during the match against Rams RFC on 27 April 2019 unless the game is cancelled for whatever reason. If the game cannot go ahead the winners will be sent a voucher to use whenever the reschedule match takes place. The voucher cannot be redeemed for cash or any product other than beers, lagers or cider produced by Shepherd Neame that is available at the CRFC bar and is not transferable.